Want to get a taste of Nvidia's Turing architecture without breaking the bank? Right now, the GeForce RTX 2060 is the way to go. Introduced last week in Founders Edition guise, the fourth-tier RTX 20-series GPU offers FHD or QHD gaming credentials for £329 and, for a limited time, comes bundled with your choice of either Battlefield V or Anthem. RTX 2060 is, in our estimation, the pick of the bunch at its supposed RRP, but if you're contemplating an upgrade, there's another question to ponder; Founders Edition or custom cooler? Nvidia's reference design is extremely tidy, but it is merely one of many options, with AIB partners bringing dozens of alternate boards to market starting today. Asus is always quick off the mark and steps up to the RTX 2060 table with seven different models headlined by the ROG Strix OC. Shall we get the bad news out of the way first? 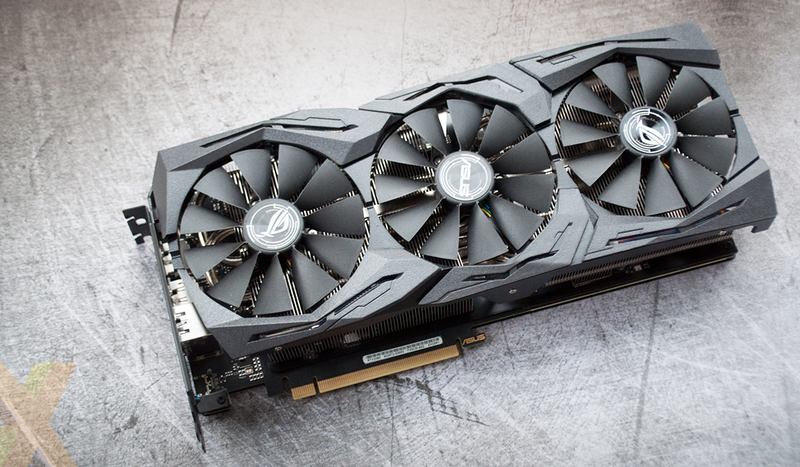 ROG Strix graphics cards tend not to come cheap, and the GeForce RTX 2060 OC variant is no exception, arriving at stores carrying a lofty £455 MSRP. That four isn't a typo; Asus's best RTX 2060 does in fact cost £126 more than reference. Madness, especially when you consider that RTX 2070 boards can be found for £460 if you shop around. We can't envisage a scenario in which paying this amount of money for an RTX 2060 makes any sense, and that's a shame as the ROG Strix OC is particularly well built and ought to appeal to Asus fans seeking a card whose lighting seamlessly ties-up with other Aura-enabled products. Rather than attempt to create a mid-sized board, Asus has repurposed its existing ROG Strix cooler, resulting in a large, 300mm x 132mm x 50mm footprint and a weight of 1.3kg. No surprises here, and given that RTX 2060 is a derivative of the RTX 2070 die, we expect most partners to carry across tried-and-trusted designs. We're not sure a mid-range GPU needs to spill into a third expansion slot, but this clearly isn't a board for those planning a compact build with minimal cabling. Veering away from Nvidia's reference eight-pin power requirement, the Asus board ups the ante by facilitating both eight- and six-pin connectors, potentially paving the way for greater overclocking headroom. Speaking of clock speeds, there is, of course, an out-the-box advantage that is emphasised by the fact that Nvidia has opted not to factory overclock the RTX 2060 Founders Edition. Whereas Nvidia's board ships with a boost clock of 1,680MHz, the Asus ROG Strix OC comes in at 1,830MHz, or 1,860MHz if you activate the optional OC mode through software. The 6GB GDDR6 frame buffer, meanwhile, operates at the usual 14,000MHz. A near-10 per cent hike in frequency is always welcome, and the Asus board isn't lacking in other value-adds. A dedicated 'Stealth Mode' button is on hand to turn off all the lights without the need for any software, a pair of FanConnect II headers allows you to attach targeted chassis fans that react to GPU temperature, there's a spare Aura RGB header, and a DualBIOS switch makes it easy to alternate between Quiet and Performance modes. The former is the default and attempts to keep noise levels to a minimum while switching the fans off when core temp falls below 55ºC, whereas the latter keeps the fans spinning at all times and adopts a more aggressive profile in favour of lower operating temps. Plenty of features, and plenty of card, too. A full-size backplate featuring an illuminated ROG logo adorns the back of the board, a rigid metal frame then sandwiches the PCB, the heatsink couldn't get much bigger, and a trio of patented 'wing-blade' fans provides the airflow. At the heart of all that, Asus uses an 8+2 phase design with Super Alloy Power II (SAP II) components, meaning high-quality capacitors, chokes, DrMOS and POSCAPs. The tinkering continues around back, where Asus has kept two DisplayPort 1.4, swapped the reference board's DVI output for a secondary HDMI 2.0b, and dropped the USB Type-C connector completely. We've never yet had the need to use the Type-C port on recent RTX graphics cards, but it always felt reassuring to know that next-gen VirtualLink VR headsets might attach via a single cable. Nvidia raising the bar with the new-and-improved Founders Edition has placed greater emphasis on partners to deliver exceptional boards. 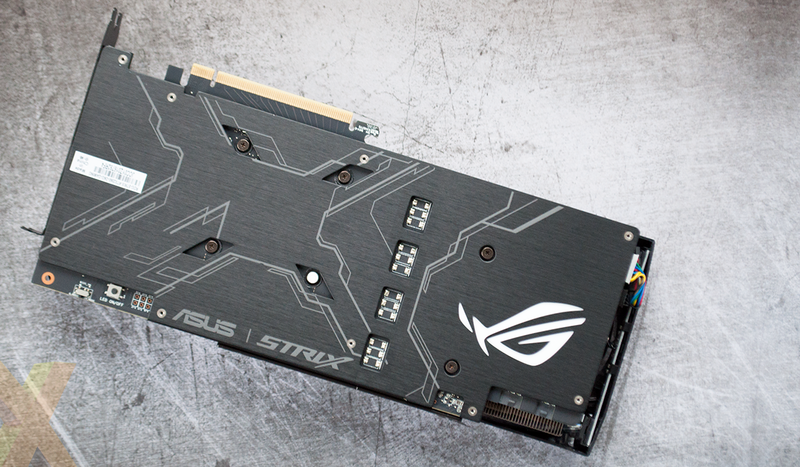 The Asus ROG Strix OC has a wide of range of features and is built like a tank, but such niceties come at a hefty cost. Let's now roll the benchmarks and see if performance is up to scratch.